Last year we had the opportunity to review Illuminating Literature from Writing with Sharon Watson. 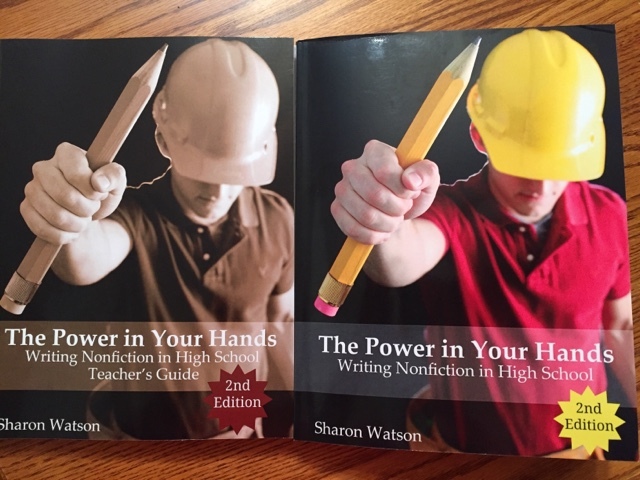 I was so impressed with it that when the Crew was offered The Power in Your Hands: Writing Nonfiction in High School 2nd Edition from Writing With Sharon Watson I knew we wanted to use this as well. Right now I have one high school student that loves to write and I have one who only writes when I make her. Delaney is my writer and I wanted her to use The Power in Your Hands so she can make the most out of her writing. She writes way more than I can keep up with and I want her to become the best writer she possibly can without the limitations of me. After receiving the book and Delaney got started I realized Amber really needs to use this course. We received The Power in Your Hands 2nd Edition and the Teacher's Guide. There are 23 chapters with 117 daily lessons that are written in a conversation style directed to the student. There is very little prep work for the teacher and this course can be used in a classroom, co-op, or homeschool with different levels of writing experience. Students will learn to write essays, reports, articles, and narratives while learning to be their own editors. The book also goes over an interview process and how to write emails, devotionals, newspaper writing, and letters of condolence and thanks. Even though the student book is written directly to the student there is so much information in the Teacher's Guide. There are charts, checklists, and grading grids for writing assignments that may be copied for your personal use only. The best part of the book for me is the Grading Toolbox for Teachers. I have always struggled with giving my older students a grade on their writing assignments and now I feel more confident in doing so. The book starts out having the student look at their Writing Self by selecting the descriptions that apply to them. Of course Delaney wanted to know what everyone would choose and compare them. Delaney chose: ~When something interesting happens to me, I like to write it down. ~I make lists and like to take notes; they help me remember sermons and lectures. ~I have many ideas for writing, and I keep them in a notebook so I can use them later. ~I like playing with words and finding just the right one. The one she put extra stars by: ~Forget everything else-let me write stories. Her older sister's response: ~ You gotta be kidding. checking this box is enough writing for me for one day. Now you see the two extremes I am dealing with. After Delaney sent her sister away she got started on her book. She really likes how this is written and she told Amber that even she could learn to write with this book. Delaney likes that the topics are things that interest her and that there are writing examples throughout the book. I like that the proofreading and grammar facts are scattered throughout this course. There are icons to indicate the sections that give information for Your Toolbox, Digging Deeper, Grammar Factoid, and Be Your Own Editor. I like that there are instructions on more than just writing an essay. It teaches writing that anyone may encounter in their daily lives. I am really happy to see that Delaney is learning to proofread her own paper. She normally writes a rough draft and then she will edit big things, rewrite it and give it to me. Since starting this she has been taking more time cleaning up her writing whether it is for me or for fun. My adult son had met a gentleman from a company that he may wish to work for when he is finished with college. The man indicated that he should come see him when he has graduated. My son wanted the man to actually see his name and information in writing and decided to send the man a short email about how nice it was to get to talk with him. Of course he called and asked me what was the best way to go about writing it. I told him what I thought and then I looked through that section in The Power in Your Hands and educated myself to help him. Hi, Lisa! Thank you for your wonderful review of The Power in Your Hands, 2nd Edition! I love to see the differences between your two daughters when it comes to writing. My own children were that way as well. The really big question is--did your son get the job?! Have a great time with your daughters this school year.